This past week was more the "mad dash to the finish line" than was the previous week. Almost done. They might be done this Friday. Might. Yet to be completed: the cabinets (there's quite a lot of work there), a bit more finish plumbing, a bit of electrical work, baseboard and door trim, frames on the mirrors, shower door installation. And painting. That painter--I don't know about her. She would rather garden than paint. Flaky. ...and one very last minute change of design I came up with. The only change I think we made. There were six accent tiles left. Five would tile the area around the bathtub. Why not use those beautiful tiles instead of the plain, off-white wainscoting tiles? Why let those beautiful tiles go to waste? 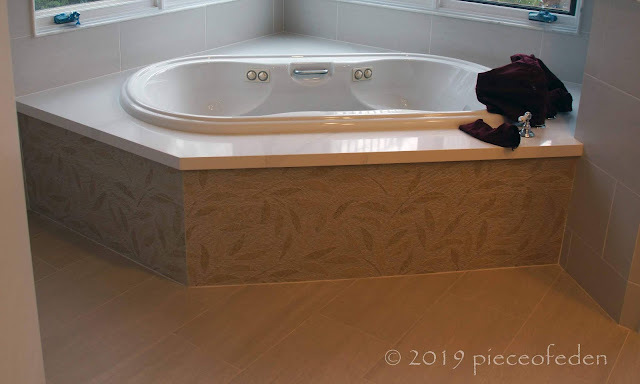 They are larger than the wainscoting tile, so less cuts, less work. Wouldn't they look great there? Or so I thought. I was taken aback to find wrangling with the tile installation company was necessary. Several phone calls. The manager came out. The designer called. Several times. Another manager got involved. All sorts of reasons why a simple change from one tile to another was a difficult and complicated problem. Except...it wasn't. They did it. Photos when the project is finally done. Hopefully Friday. Maybe. That painter--she's flaky. Those tiles are stunning. Great decision to use those instead of plain ones. Ties the tub in nicely with the feature wall. Thanks! We're happy with it. Well of course those fabulous patterned tiles belong there! I'm not surprised it was such a hassle, but I hope in the end they realized you were right. They did. After it was done, everyone said, "Great idea, looks good." All's well that ends well. 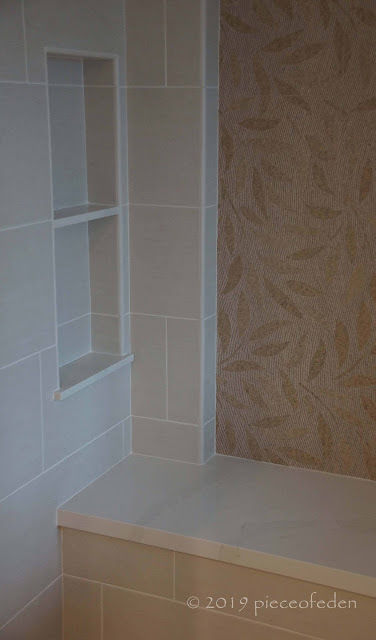 One of the reasons the patterned tile works so well there is that it subtly underscores the common function of the shower and bath. Plus it just looks great. So glad for you to be able to avoid wasting that kind of material. Thanks, Nell. I thought of the "repeated plants = garden unity" concept. Congratulations on your win over mindless bureaucracy! The new tile looks great. Meanwhile, as our project creeps closer and no longer looks like it's going to implode before it starts, I'm getting more and more nervous. Permits are still pending but first we need to have the wall to be removed tested for asbestos and get sign offs on the project from the AQMD, the local fire department and, believe it or not, the school district! Sign offs from AQMD???? School district???? Great that your project is moving forward! You have put so much thought, time, effort and the cost of the geological report into it already. If the local government issues permits and the work is inspected...weird. Fire dept, I can see them wanting to know about equipment access in case of fire if the footprint of the home is changing. Not critical in your case since you are not doing a huge expansion, not adding a second story, etc. Perhaps just a routine check? We got a county permit and the work was done (plumbing moved 18") and the county inspector inspected and signed off on it and that was it. There was that thing with the inspector wanting a bathroom fan but the supervisor after hearing about our six windows said we were okay. Thanks! I surprised myself by being more assertive than normal. I'm trying to get that painter motivated with a cup of hot coffee at this moment. We'll see if that helps. As we are *almost* embarked on a main bathroom facelift, I have followed your progress with interest. This project is coming together beautifully. I REALLY like the way you incorporated the lovely, leafy tile into the bath surround. That's the kind of change to make! Wishing you speed and precision with the painting. Neither is my strong suite, but we always try to economize by having one of us do it. Ben's a better painter but I am more limber for getting into tight corners and low spots. It works. Most of the cost of painting is the labor, so it does save money to DIY. Best of luck with your bathroom facelift. Are you going to blog it? It is a great way to remember the misery. Hopefully you don't have one of those Showers That Take Forever To Tile. Three extra weeks of chaos. Getting closer to being able to look back and laugh about it. Nice to get double the pleasure from your leafy tiles. Being able to look back and laugh--that sounds so good right now! Oh, you little design rebel, causing all sorts of upheaval and mischief. Good call, though, 'cause those leafy tiles are absolutely drool-worthy. Now, ENJOY! !